Hill's Prescription Diet Canine/Feline a/d offers nutritional support to pets recovering from accidents, surgery and serious illness. Your pet has extra nutritional needs when they're recovering from a traumatic event such as surgery, accident, or illness. Their body needs extra nutrients and a lot of energy to heal and rebuild the immune system. This food has been developed to address those added needs, along with an appealing taste and soft texture to encourage them to eat. The soft texture is great for syringe-, spoon- or hand-feeding for animals who can't quite make it to their bowl. The food has a high calorie and fat content to give pets all the energy they need to recover. The high level of protein helps to preserve the body's lean muscle mass, promotes faster wound healing, and also gives the immune system an added boost. Added potassium helps avoid blood potassium levels dropping, which can lead to muscle cramps and pain. Extra omega-3 fatty acids can reduce inflammation and ease pain. All of the ingredients are highly digestible, putting less strain on the pet's gastrointestinal system and ensuring they get every drop of nutrition out of every meal. nutritionally complete: can be only food source. This food should be used to help your pet get the nutrients they need while they recover. Feeding schedules differ depending on your animal's need, such as whether they've been prescribed cage rest, are suffering from an injury such as head trauma or a burn, or if they're recovering from surgery, blood poisoning, cancer or fever. The amount you feed them will also depend on their weight. This food isn't suitable for animals whose recovery means they need to avoid fluid retention or high levels of phosphorus or sodium. It's also not recommended for pets who are intolerant of fatty foods, such as animals with or at risk of pancreatitis. Because veterinary diets are formulated for the nutritional support of pets with specific clinical conditions, we recommend that you only use them under professional advice. 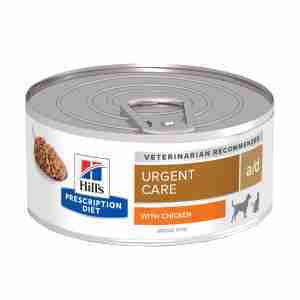 For more information on feeding Hill's Prescription Diet Canine/Feline a/d to your dog or cat, please consult your veterinary surgeon.